What is Lung Cancer and Why it Happened ? Lung cancer is a cancer that forms in interlining cells of air passages. Main types are small cell lung cancer and other one is non small cell lung cancer. These types are based on how the cells look under a microscope. In US, in 2009 new lung cancer cases are estimated to be 219,440 and estimated death rates are 159,390. What are the different signs and symptoms of a lung cancer? A lung cancer symptom is always varied and depends upon the widespread nature of tumor. Warning signs of a lung cancer are not always easy to recognize for identification. A person having a lung cancer may have the following types of symptoms. First of all, a person can have no symptoms to be identify.But, many people develop symptoms, which are, in fact, the results of primary tumor, effects of tumors, which are metastatic by nature and develops in other parts of a body, hormonal disturbance or other symptoms that are caused by cancer. Symptoms of a primary lung cancer basically include chest pain, shortness of breath and cough with blood. A cough in new smoker or old sessions in him should be evaluated by a physician. Cough with blood is called hemoptysis occurs in a large number of people having lung cancer. One fourth people having lung cancer suffers from a chest pain. The pain is basically persistent, aching and dull and can also involve in it other structures that surround the lung. Breathe shortening results from any blockage in lungs that prevents normal free passage of air through the lungs. Hoarseness and wheezing usually signal the inflammation in the lungs that may go with cancer. 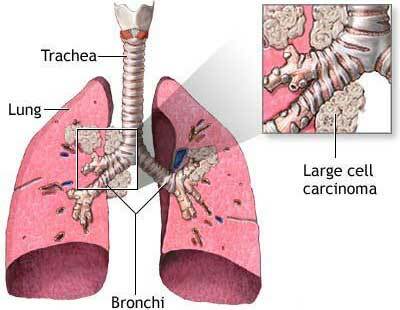 Repeated infections related to the respiratory tract like pneumonia or bronchitis are also the signs of a lung cancer. Metastasis to bones is also common with a small cell cancer. Lung cancer that has been metastasized to bones may cause pain in bones, mostly in the backbone, the ribs and the thigh bone. Lung cancer which spreads to brain may cause difficulties in person’s vision and seizures or weakness on the other side of a body.